Antonio Esfandiari (born Amir Esfandiari), who is also known as "The Magician", was born in Tehran, Iran on December 8, 1978. His hometown is San Francisco, California. When he was 9, he and his family moved to San Jose, California and from there on, Antonio's way of becoming a poker player has begun. At the age of 19 he changed his name from Amir to Antonio and became a professional magician, hence the nickname given him by his poker friends. One day, while performing magic tricks, he was invited to game of poker (Texas Hold'em) - and the rest is history. 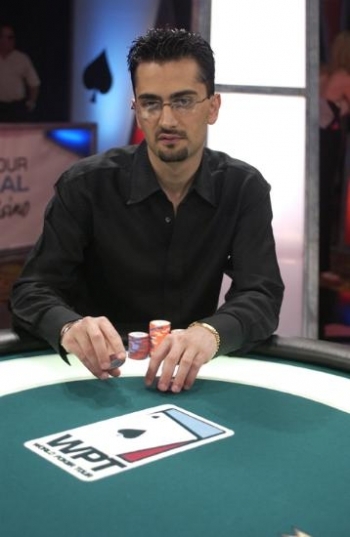 Esfandiari is a known and loved professional poker player and he has appeared several times in TV poker shows. He appeared on season 2 and 3 of the Poker Superstars Invitational Tournament, and although he finished last in the second season, Antonio got his game straight and won the second place in the show's third season. He also appeared in four seasons of GSN's High Stakes Poker series, where he faced Phil Helmuth, Phil Laak, Daniel Negreanu and other professional poker players. He also made his appearance in all seasons of NBC's Poker After Dark. 2008 was also a good year for Esfandiari as he made his way to the final table of the PokerStars EPT Grand Final that was held in Monte Carlo. He finished in 8th place and grabbed $266,004. As of 2008, his total live tournament winnings exceed $3,000,000. Esfandiari is a good friend of poker professional Phil Laak. Being a magician earned him another skill, as he is well known for his chip tricks.